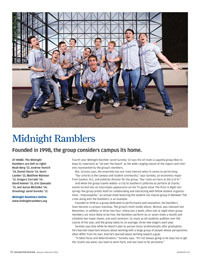 Midnight Ramblers Founded in 1998, the group considers campus its home. 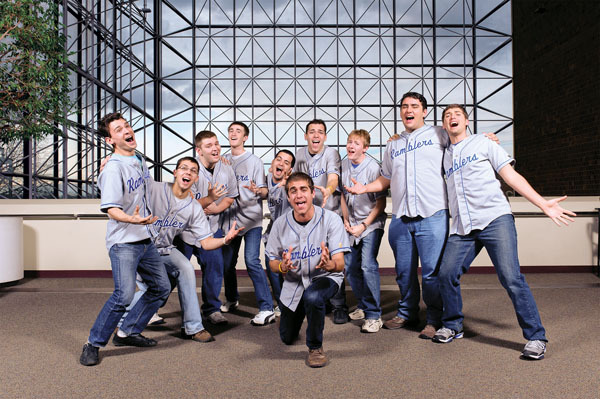 Fourth-year Midnight Rambler Jared Suresky ’12 says the all-male a cappella group likes to keep its repertoire as “all over the board” as the wide-ranging nature of the majors and interests represented by the group’s members. But, Suresky says, the ensemble has one main interest when it comes to performing. And while the group travels widely—a trip to Southern California to perform at charity events turned into an impromptu appearance on the TV game show The Price Is Right last spring—the group prides itself on collaborating and interacting with fellow student organizations. “Improvapella,” an annual show featuring the student-run improv group In Between The Lines along with the Ramblers, is an example. Founded in 1998 as a group dedicated to performance and innovation, the Ramblers have become a campus mainstay. The group’s ninth studio album, Revival, was released last November. In addition to three two-hour rehearsals a week, often late at night when group members are more likely to be free, the Ramblers perform six or seven times a month and schedule two major shows, one each semester. As many as 60 students audition over the course of the year, and the group takes in, on average, three new singers each year. Suresky says that while he doesn’t plan to pursue music professionally after graduation, he’s learned important lessons about working with a large group of people whose perspectives often differ from his own. And he’s learned about working toward a goal.